Located in the town of Bann Baa. 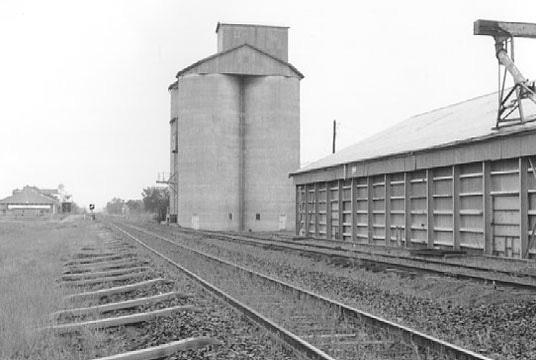 Werris Creek to Moree line. 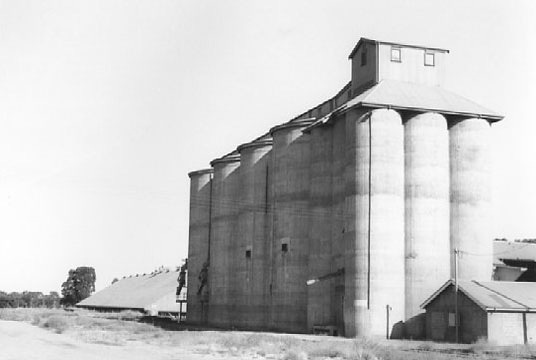 Original concrete silo type S027 [2700 tonnes capacity] built in 1934. 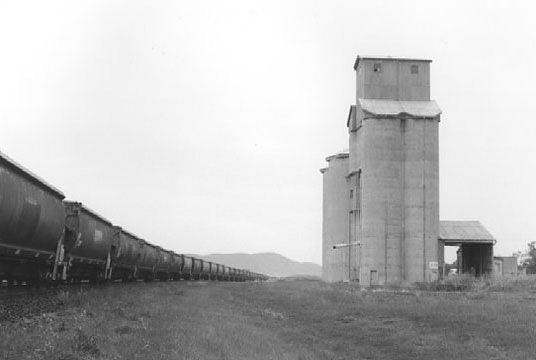 Type D150 bulkhead [15000 tonnes]added in 1967. Near site of fatal level crossing smash in 2004. 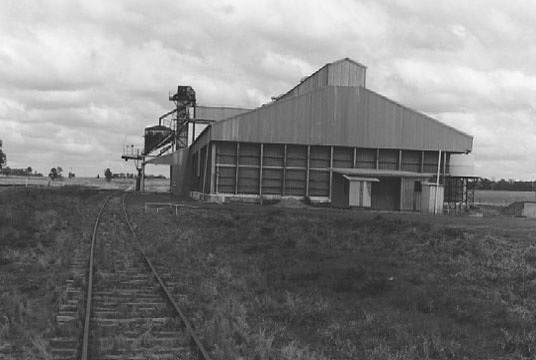 Bulkhead only , type and capacity unknown. Location only with old hall and a few houses. 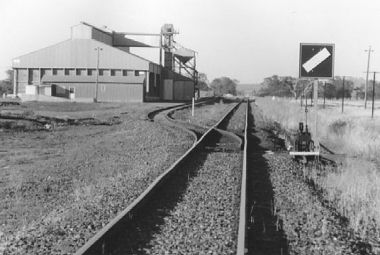 Dubbo to Coonamble line , operational line but little sign of recent use. Type D150 bulkhead [15000 tonne capacity] built in 1966. 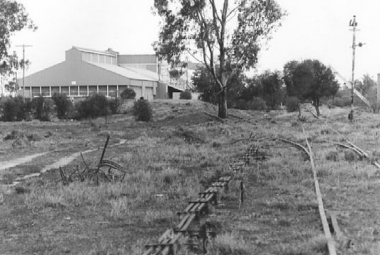 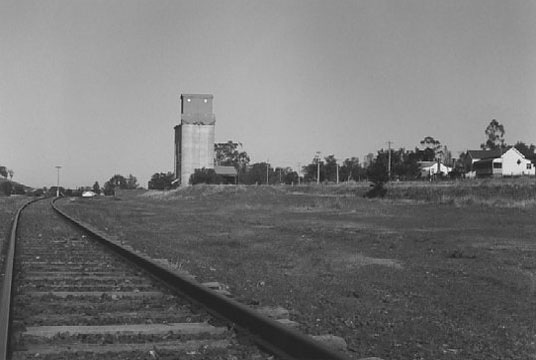 Culcairn to Corowa line, disused. 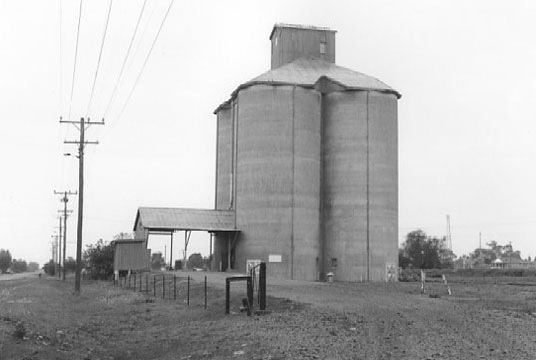 Concrete silo Metcalf S082 [8200 tonne capacity]built in 1920. No sign of recent use , although 2 loading bays still operational. Located between highway and village. 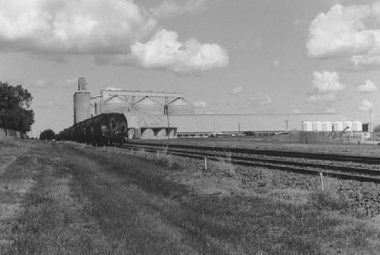 Bulkhead only type D150 [15000 tonne capacity] built 1970. Binnaway to Gwabegar line, abandoned. 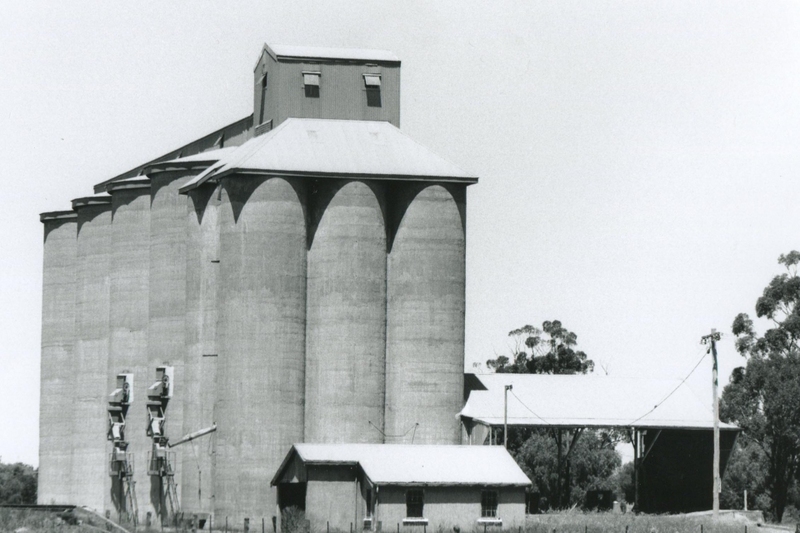 Original concrete silo type S027 [2700 tonne capacity] built in 1935.Bulkheads B067 [6700 tonne] added in 1959 and A299 [29900 tonne] in 1967. 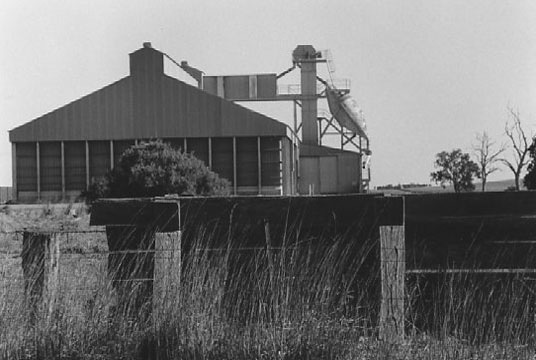 No sign of recent use. 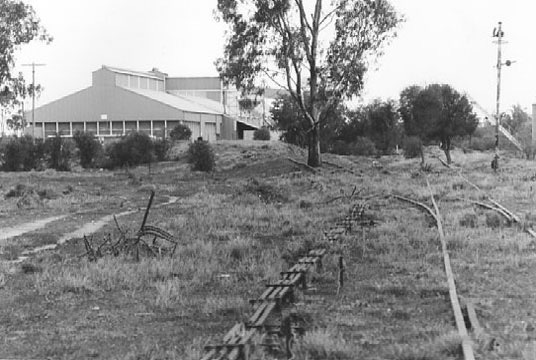 Located down line from main street. 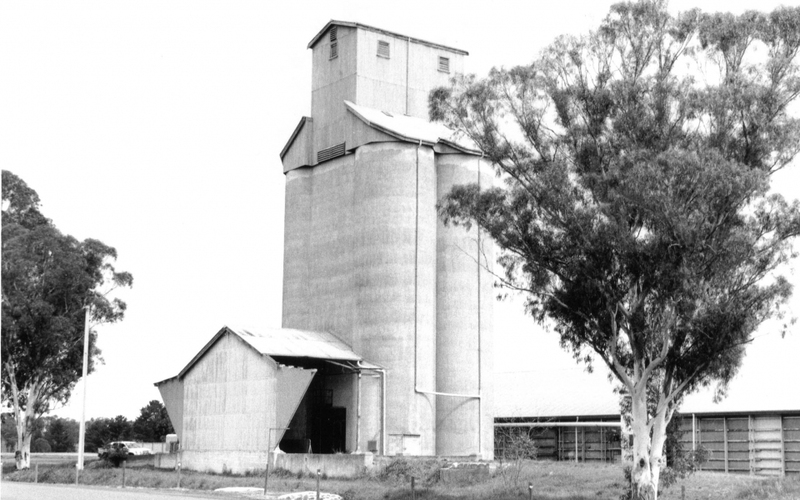 Original concrete silo type S095 built between 1918 & 1929 [9500 tonne capacity]. C Depot bulkhead C288 [28800 tonne] added in 1968. 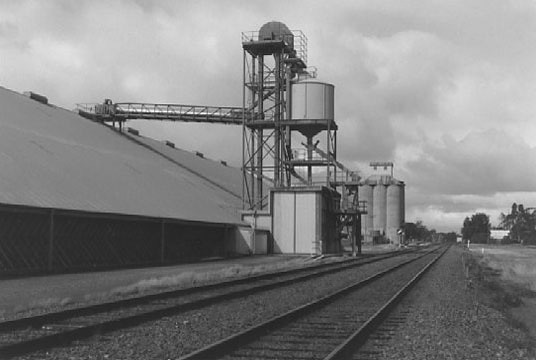 Original concrete silo is type Metcalf S082 [8200 tonnes capacity] built in 1922.The A Depot A299 silo [29900 tonne] was added in 1967. 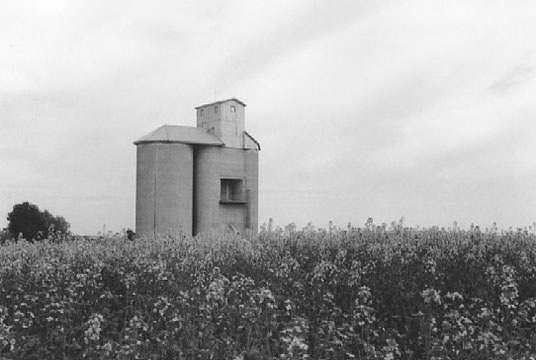 Located well out of town. 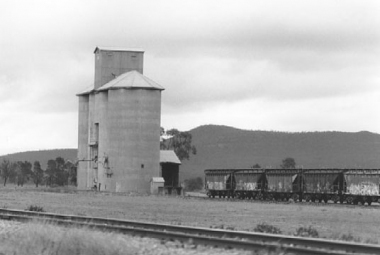 West Tamworth to Barraba line. 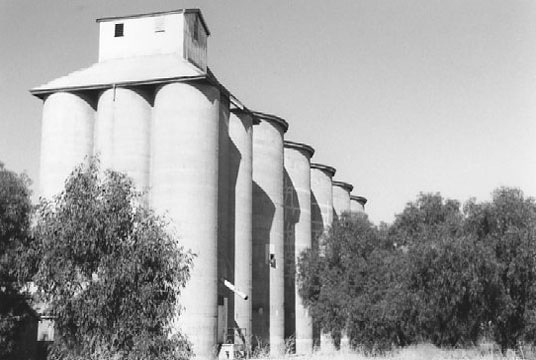 Silo type and construction date unknown.Bulkhead is type D150 [15000 tonnes capacity] built in 1968. 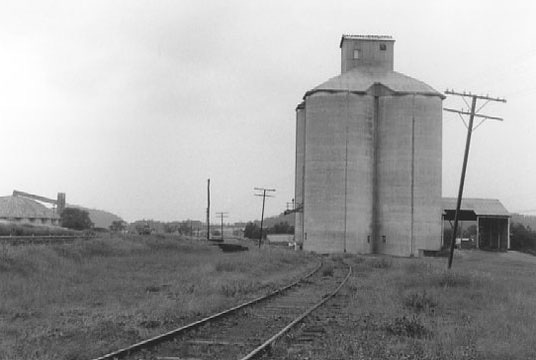 Located in main street of small village. 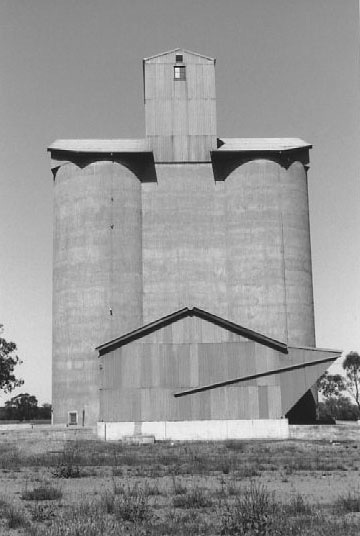 Concrete silo type Metcalf S082 [8200 tonne capacity] built in 1923. 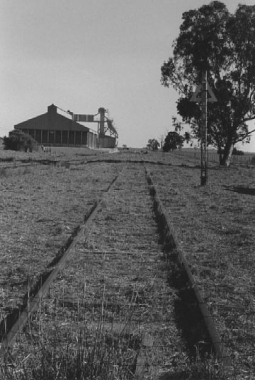 A few houses around location. 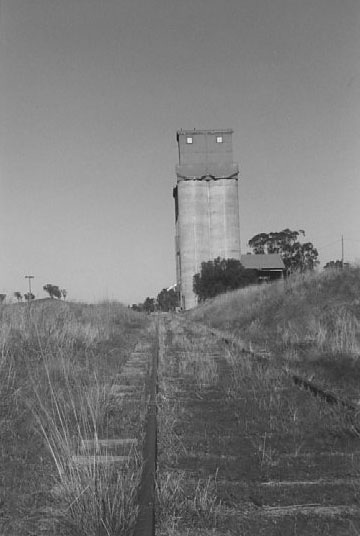 Uranquinty to Kywong line. 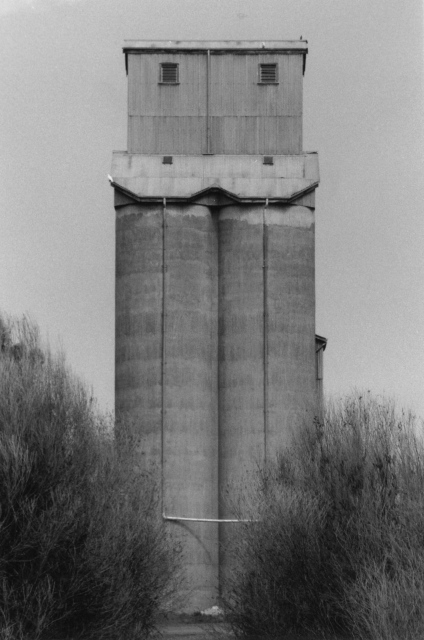 abandoned. 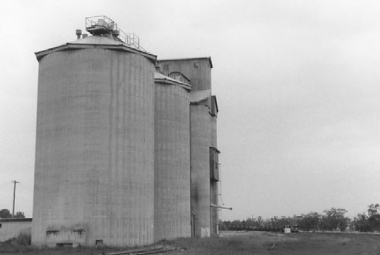 Concrete silo type S024 [2400 tonnes capacity] built in 1931. 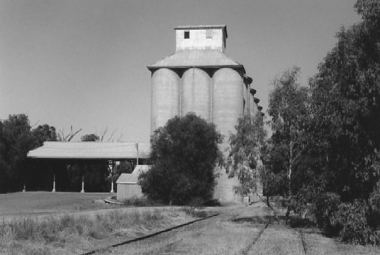 Located on line running parallel to Newell Highway. Moree to Werris Creek line , operable. 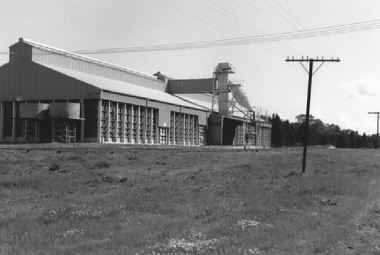 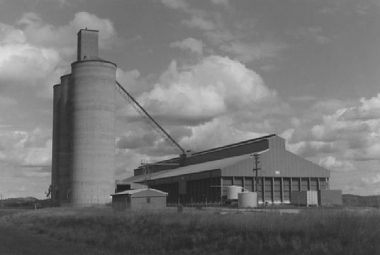 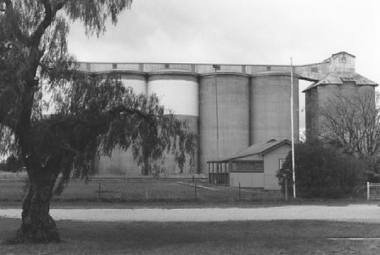 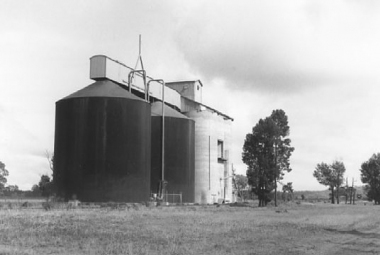 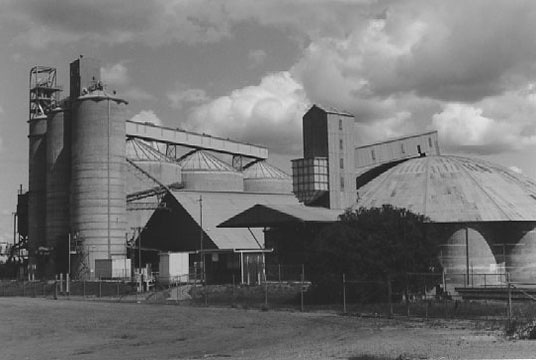 Large facility with 3 silo types including circular A123 [12300 tonne capacity] built in 1955.Also on-ground storage. Demondrille to Cowra line. 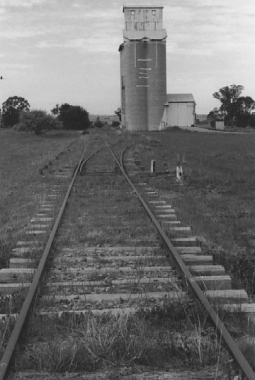 Main line in use but not siding. Concrete silo type S016[1600 tonne capacity] built in 1934. Location only, not even a farm building in sight. Stockinbingal to Parkes line , operable. Concrete silo type S016 built in 1934.Original silo with no additions. Narrandera to Tocumwal line , long abandoned. Large buklkhead and original concrete silo type S068 Metcalf [6800 tonne capacity] built in 1922. Cowra to Eugowra line , abandoned. Concrete silo type S024 [2400 tonne capacity] built in 1929. 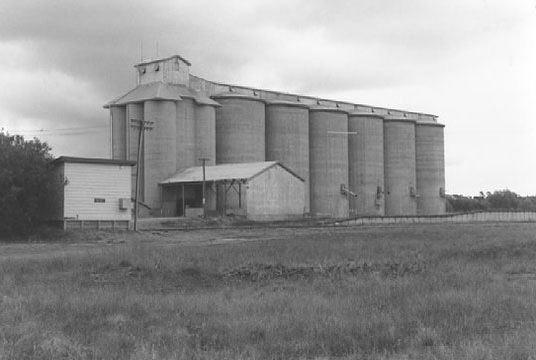 Located in village off highway. 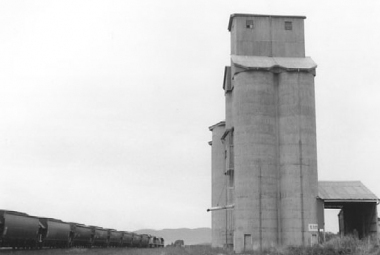 Original concrete silo type S008 [800 tonnes capacity] built in 1934.The C409 bulkhead [40900 tonnes] was added in 1965. 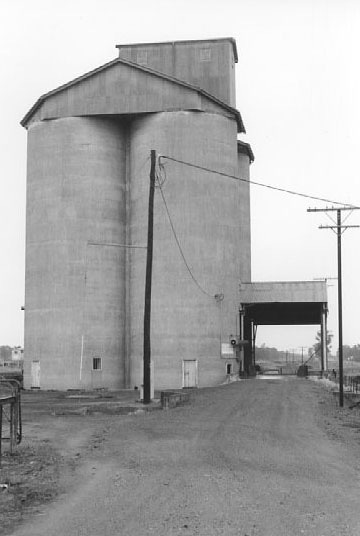 Circlular concrete silo type A191 [19100 tonne capacity] built in 1955. 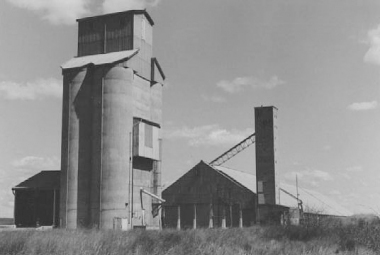 Original cocrete silo type S027 [2700 tonne capacity] built 1935. 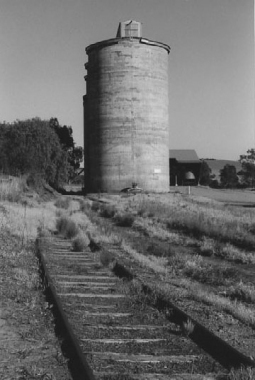 Water tank and a number of siding lines well maintained including silo loading. 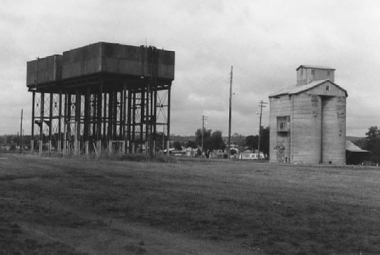 Set in large park, no fences. 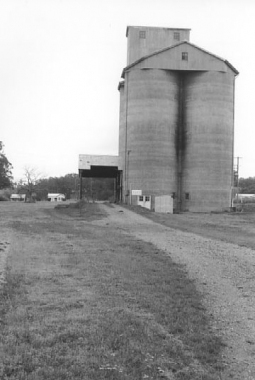 Old grain truck as exhibit. 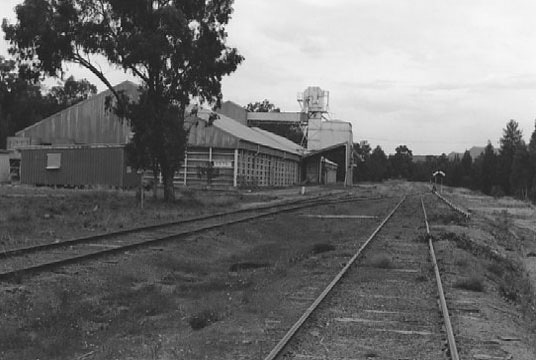 Cootamundra to Griffith line , operational. Concrete silo type S024 [2400 tonne capacity] built in 1928 and extended in 1934. Graffitied waggons parked in siding but site deserted. 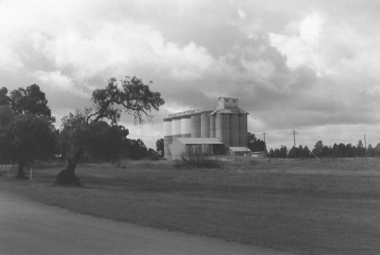 Location only with a few houses. Wallerawang to Merrygoen line. 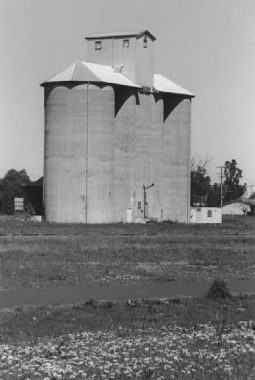 Original concrete silo type S054 [5400 tonne capacity] built in1941. The bulkhead type C288 [28800 tonne ] was added in 1968 ie “C” Depot. 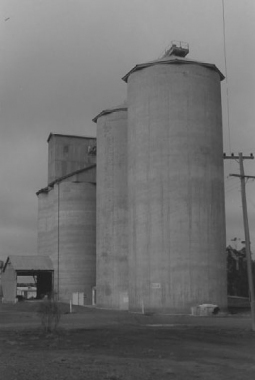 Original concrete silo type S054 [5400 tonne capacity] built 1920,thre bins added in 1937.Also 2 bulkheads, the smaller a type B067 [6700 tonne]added in 1959. 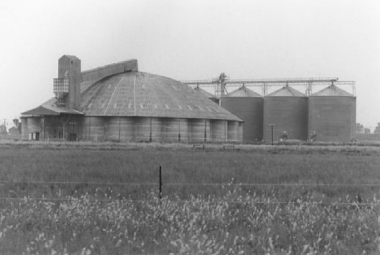 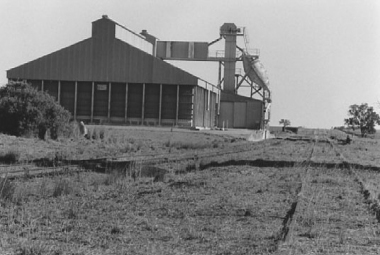 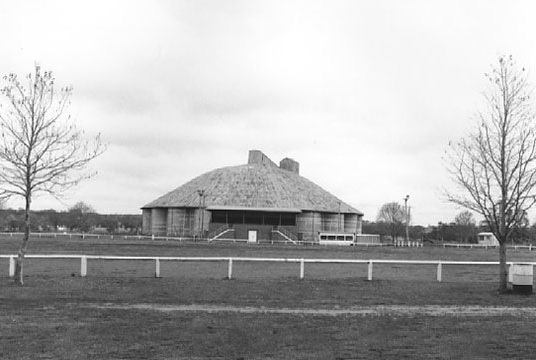 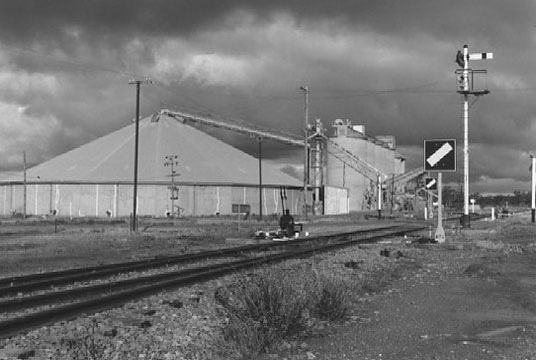 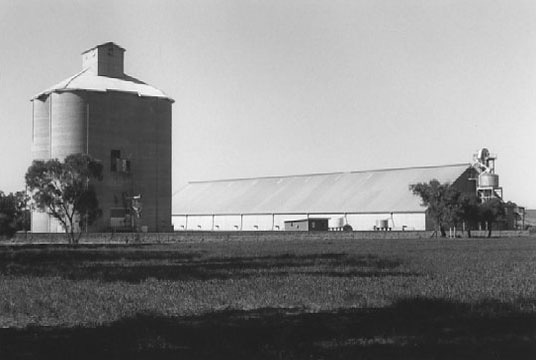 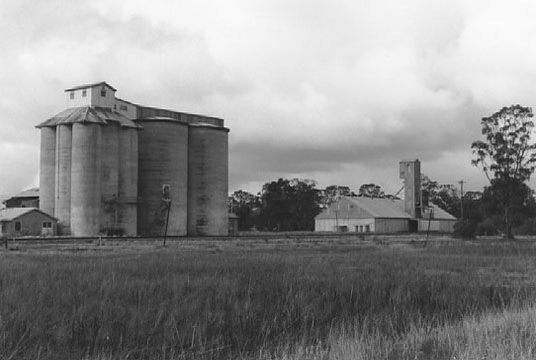 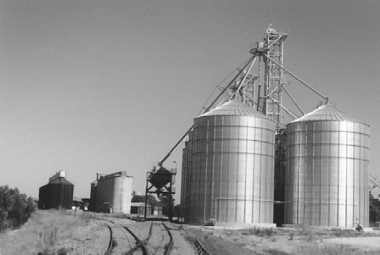 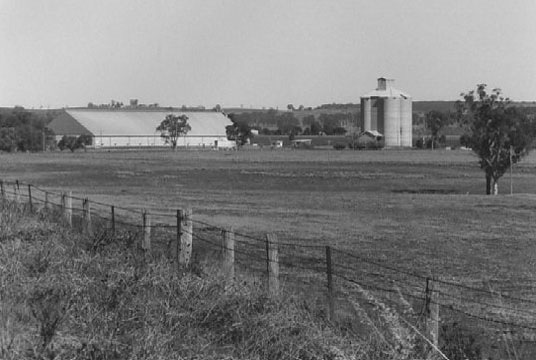 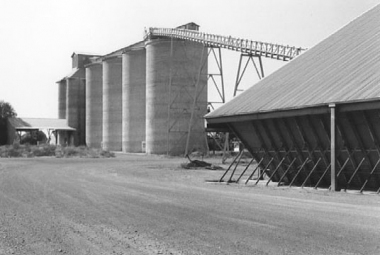 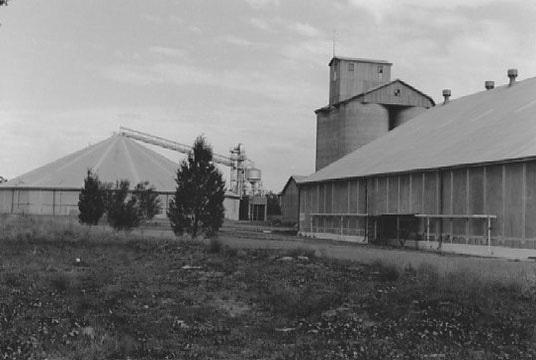 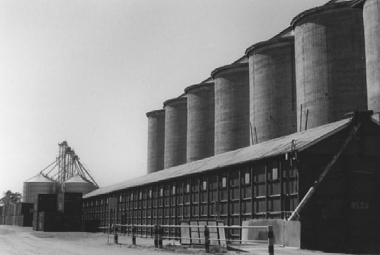 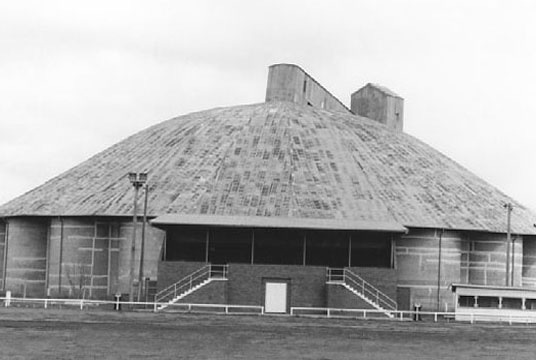 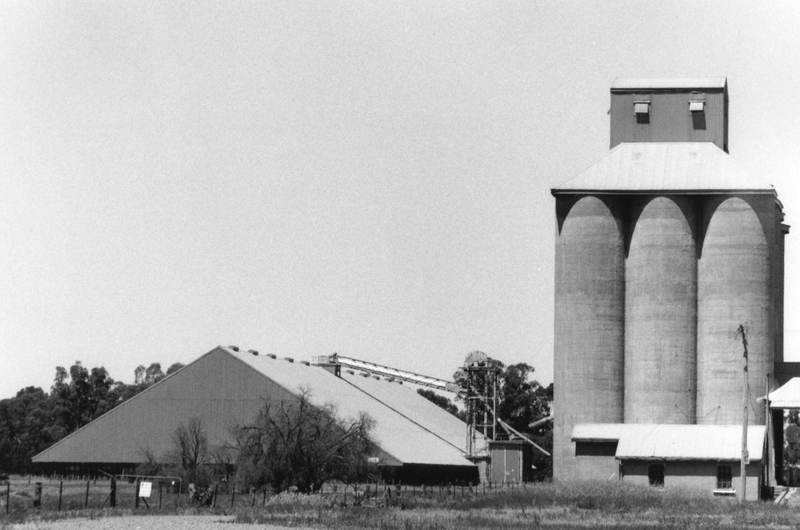 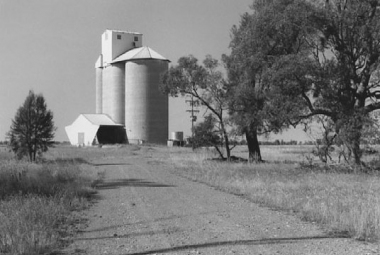 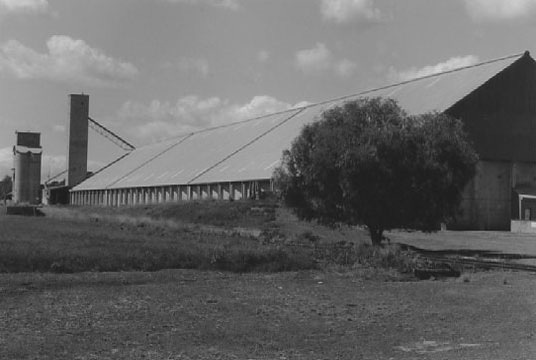 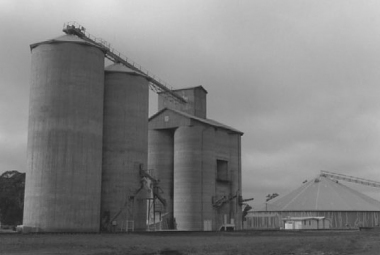 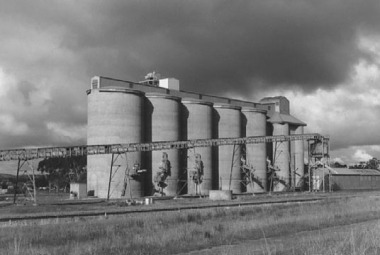 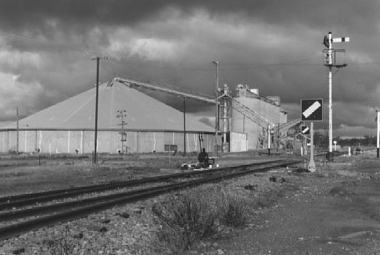 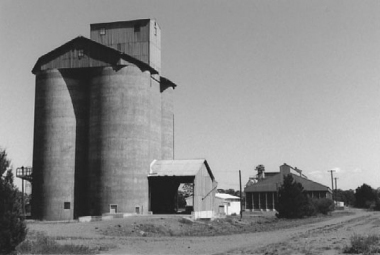 The 3 facilities represent different eras of grain storage. 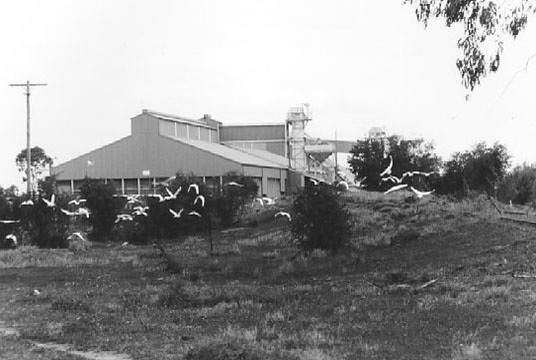 Located in rundown town on Newell Highway, behind locked gates. Camurra to Boggabilla line, abandoned. 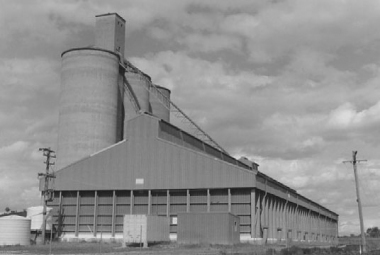 Two bulkheads, D150 [15000 tonnes capacity] built in 1966 and type C288 [28800 tonne] added in 1968. Line maintained as far as North Star only. Located on outskirts of small town. 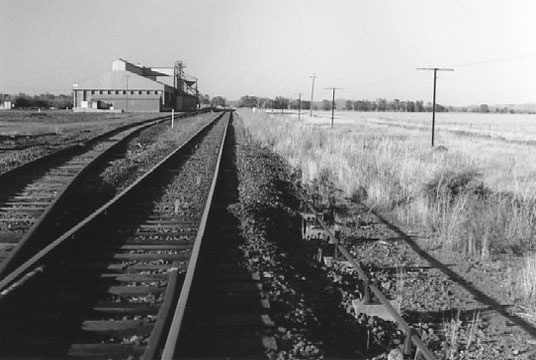 Werris Creek to Moree line.Major track maintenance in progress. 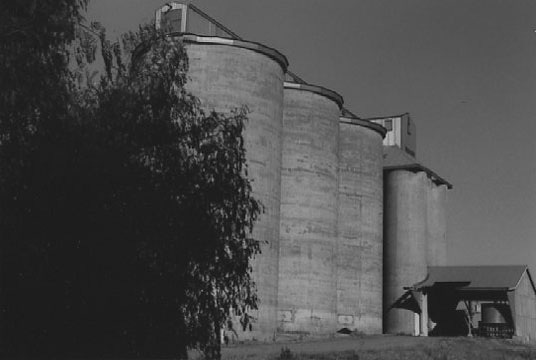 Original concrete silo type S041 [4100 tonnes capacity] built in 1934.The A285 circlular silo was added in 1955. Also more recent steel silos. 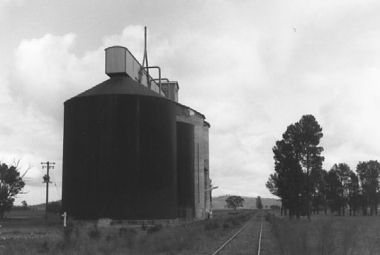 A type D150 bulkhead [15000 tonne capacity] built in 1970. 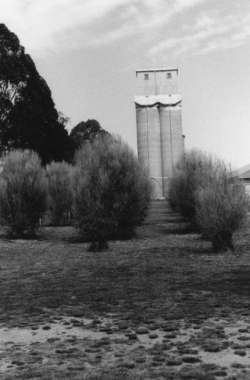 Located in centre of town. 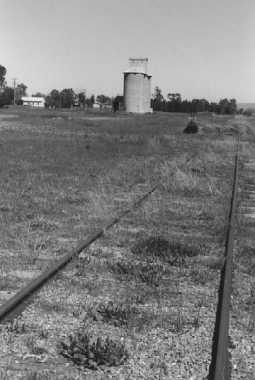 Galong to Boorowa line, abandoned ; little sign of original rail lines beyond bulkhead on edge of town. Original concrete silo type S008 [ 800 tonnes capacity] built in 1929. 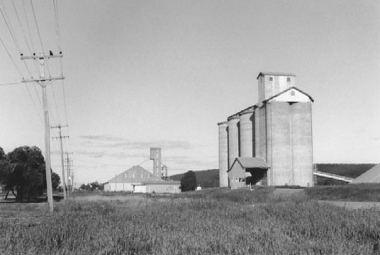 Located in small town [population 125]. The Rock to Oaklands line. Large silos including Cor Ten steel,new corrugated steel, and older bulkheads. 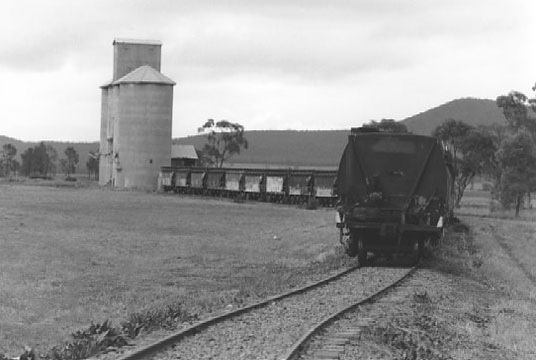 The whole of branch line from The Rock to Boree Creek to be upgraded at time of photograph.Rail enthusiast and polititian Tim Fisher has been lobbying this for years. 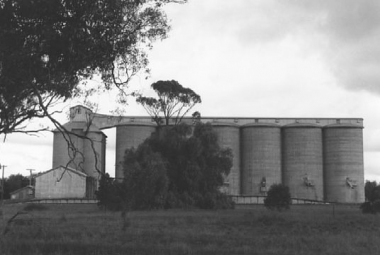 been lobbying this for years. Werris Creek to Moree line , operational. 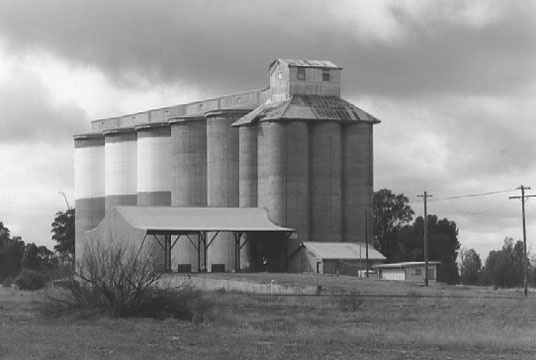 Original concrete silo type S008 [800 tonnes capacity ] built in 1934.Two additional bins added in 1959 [capacity 3550 tonnes]. On edge of rundown village. 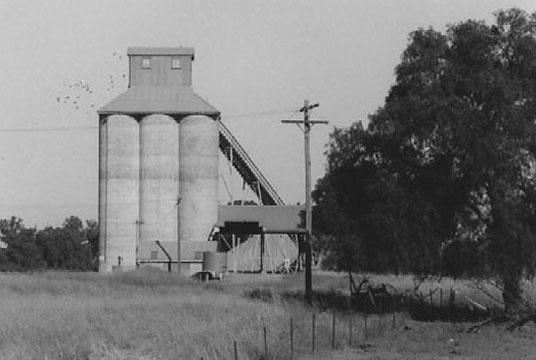 Stockinbingal to Parkes line, operational. 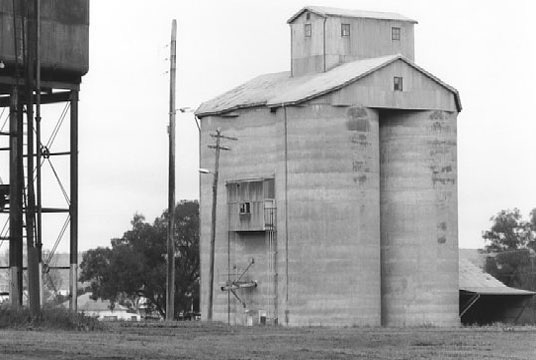 Original concrete silo type S041 [4100 tonne capacity] built in 1922,two extra bins added later.Two bulkheads including type B063 [6300 tonnes]built in 1959. 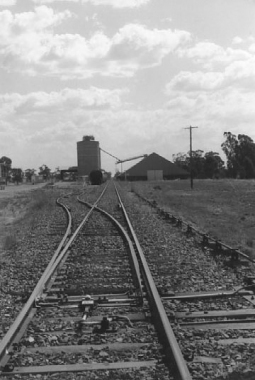 Culcaiarn to Corowa line, abandoned. Original silo type S068 [6800 tonnes capacity ] Metcalf built in 1922.Also large bulkhead. 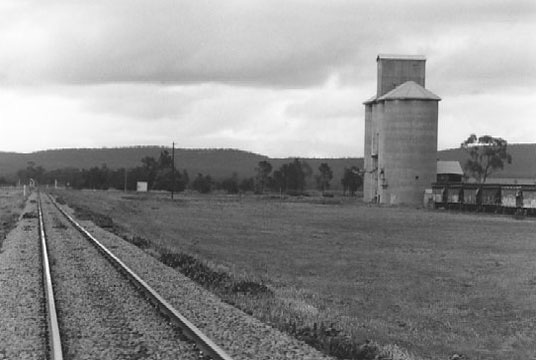 Koorawatha to Grenfell line, abandoned. Original concrete silo type S016 [1600 tonne capacity ] built in 1932. Disused silo off dirt road. Junee to Narrandera line, operational. Original concrete silo type S041 Metcalf [4100 tonnes capacity] built in 1922.Extra bins and bulkhead added later. Location only , not a farm building in sight. 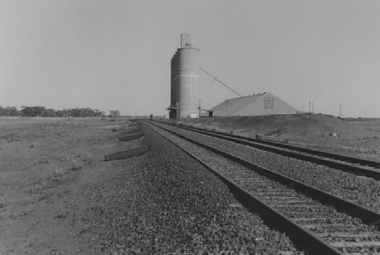 Barmedman to Rankins Springs line. 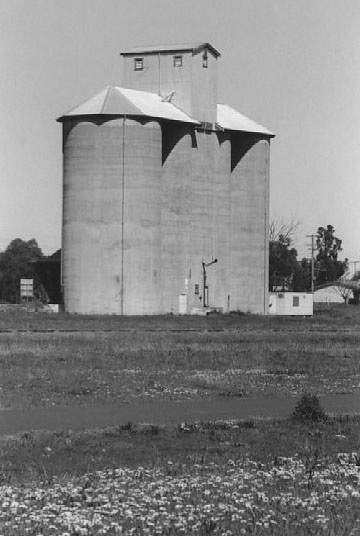 Original concrete silo type S041 [4100 tonnes capacity] built in 1928. Location only in cypress forest. 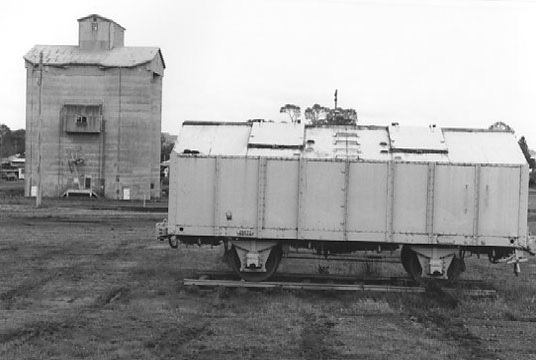 Older type bulkhead , not used recently.Construction date and capacity unknown. 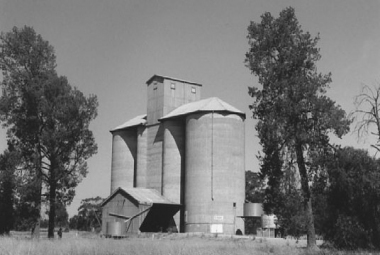 Original concrete silo type S027 [2700 tonne capacity] built in 1936. Extra 7100 tonne added in 1977. Access along dirt road from Weethalle despite size of facility. 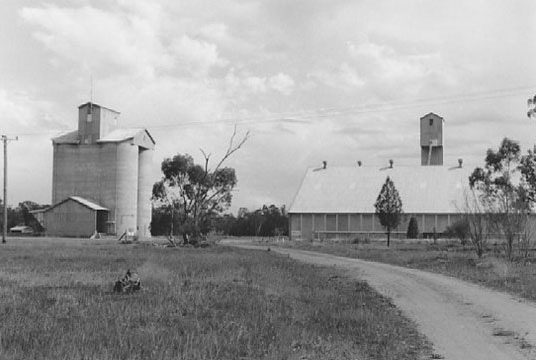 Located in small village with pub and a few shops. 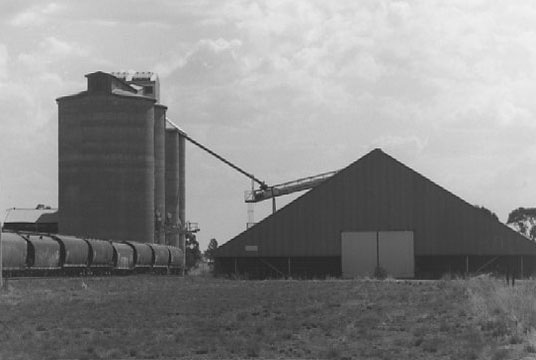 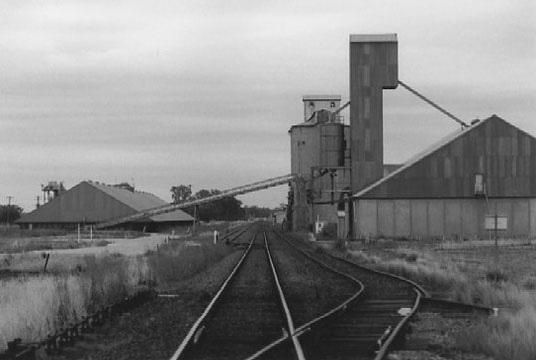 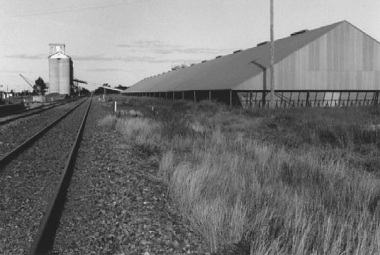 Wyalong to Burcher line,used in 03/04 season for grain haulage only. Original concrete silo type S027 [2700 tonne capacity] built in1936 , 6800 tonne added in 1961.The A299 circlular silo [29900 tonne ] was added in 1968. 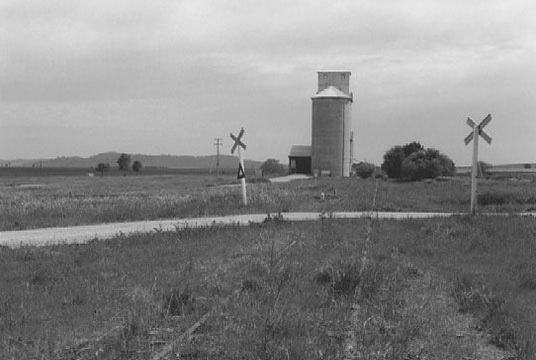 Location only, dirt road access. 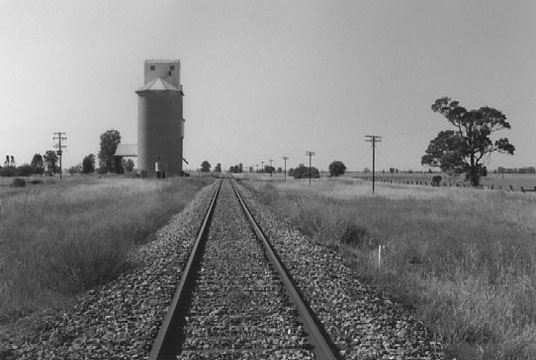 Wyalong to Lake Cargelligo line. Original concrete silo type S027 [2700 tonnes capacity] built in1934.The D150 bulkhead [15000 tonne] was added in1968. Located on edge of small village. Narrabri to Walgett line,major upgrade at time of photograph. 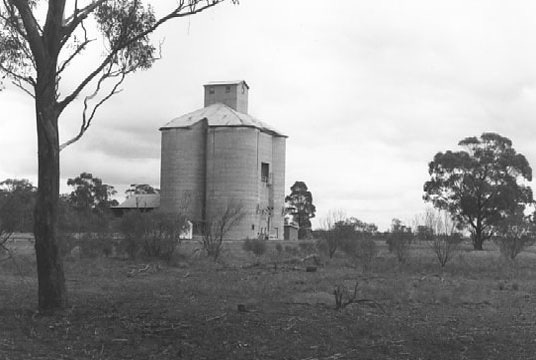 Type and construction date of banded concrete silo unknown.Also large bulkhead.Similar silo at Wee Waa and others in NW. 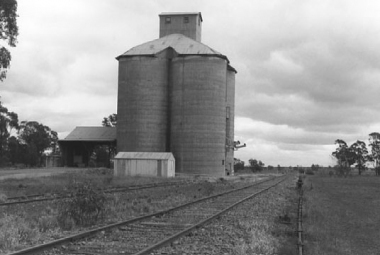 Located on defunct line about 4 km from village. 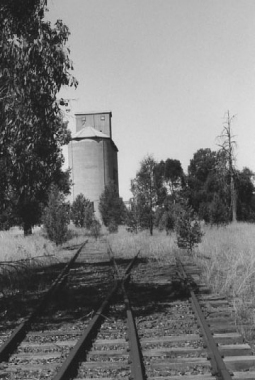 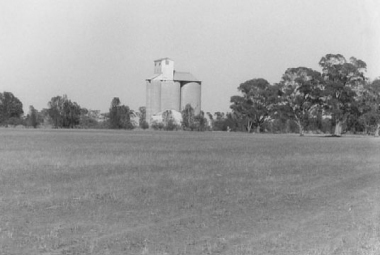 Culcairn to Corowa line, abandoned. Concrete silo type S054 Metcalf [5400 tonnes capacity] built in1920. In private hands , remnants of railway buildings.